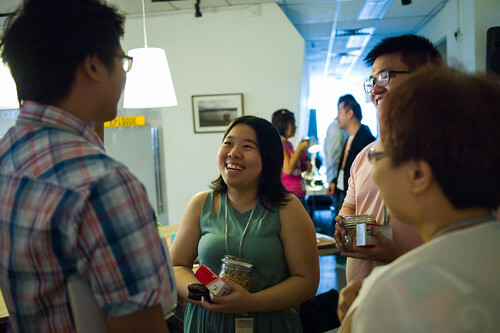 Up Close and Personal – Shiao Yin, founder of Food for Thought sharing the UCP participants on her journey from student to entrepreneur. 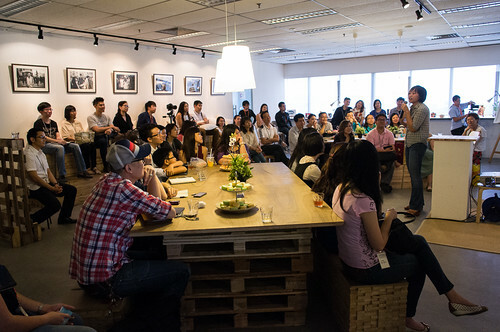 I had the privilege of attending session 2 of UCP (Up-Close and Personal) by SODE (School of Design and Entrepreneurship), a networking session for established and budding entrepreneurs to meet and greet, draw inspiration from each other and exchange ideas and discover business opportunities through activities like workshops, speed networking and talks by more established members of the community. These forums and workshops are designed to help entrepreneurs network and also gain experiential knowledge. 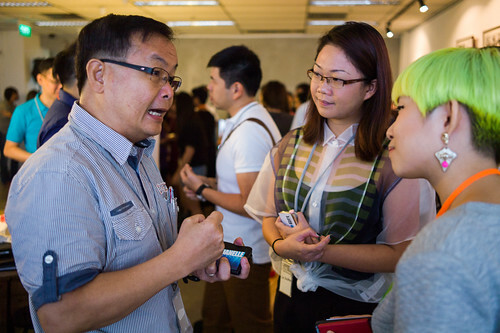 I missed the first session, where Ms Elim Chew (Founder of 77th Street) and Mr Aries Zulkarnain (Executive Pastor of City Harvest Church) shared the secrets of succeessful businesses and networking skills. 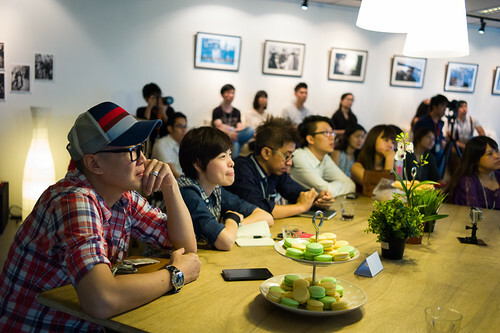 I decided to check out the second session of UCP – the theme was food, and the speakers were Mr Edward Chia (Founder of Timbre Group) and Ms Kwek Shiao-Yin (Founder of Food for Thought). Kuik Shiao-Yin is co-founder and creative director of the Thought Collective, a business group comprising of a tuition school, restaurants and publishing house. She shared on her journey of self discovery, from her stint studying in the United States, to working in a dotcom company in the boisterous era before the dotcom bubble burst, to starting a tuition centre and finding herself start her first restaurant with a group of friends on a “gun and run” style – where decisions were made based on gut feel, raw courage and a lack of the fear of failure. This fearless attitude propelled her to venture into other restaurants, most notably Food for Thought at the Botanic Gardens. On the 25th of May, she will be opening Food for Thought at the National History Museum as well as rebooting Food for Thought at 8Q into a burger shack / pop-up museum. City College played host to UCP session no 2 as over 40 entrepreneurs, businessman and woman gathered to network and share ideas. 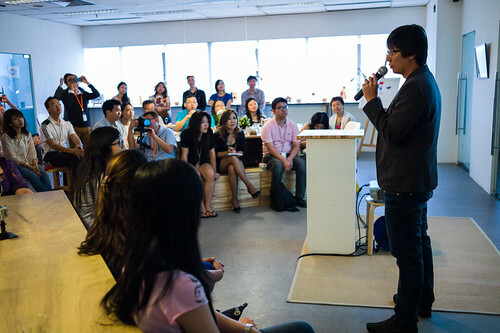 At the age of 27, Edward Chia already runs 11 businesses, including a music school. For Edward, at the age of 27, he is already running 11 businesses. At the age of 21, where guys his age are still fresh from the army or just entering university, Edward started Timbre @ theSubstation with his business partner. He and his partner Danny Loong, 39, now run 11 different brands of music, food and beverage (F&B) outlets, ranging from cocktail bars to music festivals, delivery and catering services and even a music academy. 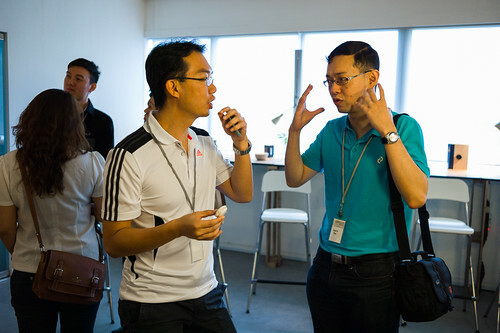 Edward Chia of Timbre giving advice to a participant of UCP. Besides building successful businesses, these two individuals had also created positive change in our communities. Both being Christians, they talked about how they use their talents to serve God, and more importantly, create positive changes in the community with their businesses. 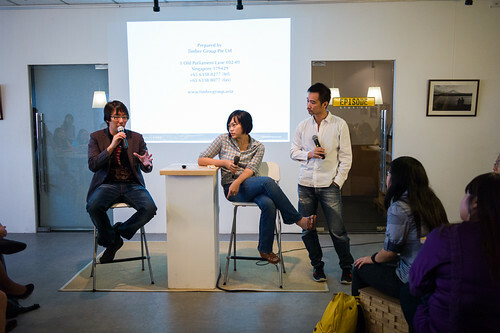 Entrepreneurs for change – Edward, Shiao-Yin and Kenny take the stage during the Q&A session. Participants listening intently to the UCP speakers. Macarons on the table are sponsored by macarons.sg. It was truly a day where the food industry came together. Their individual visions for their businesses was not written with a focus on dollars and cents, but on meeting the needs of the community. 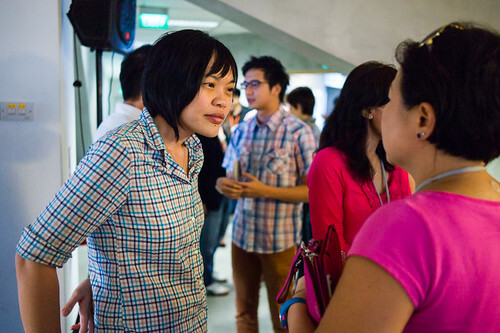 For Shiao-Yin, she believes in creating change by transforming community spaces and bringing people together through good food for good causes, and Food for Thought was conceived as a space for bringing the community together. For Edward, his interest in music led him to create Timbre as a space where budding musicians can perform for pay, in a country like Singapore where Science and Math are more highly valued as compared to the performing arts. Through his efforts, many musicians have turned professional, and Timbre became a place where new talents are constantly unearthed and the next generation of musicians groomed through public exposure. 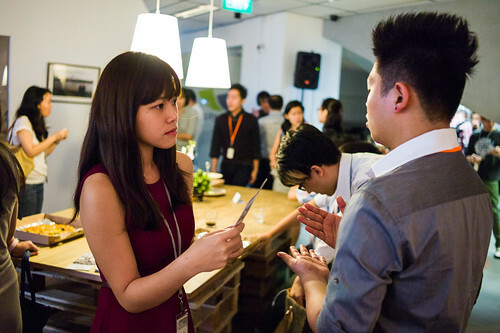 Speed networking session allows participants to meet many other entrepreneurs. 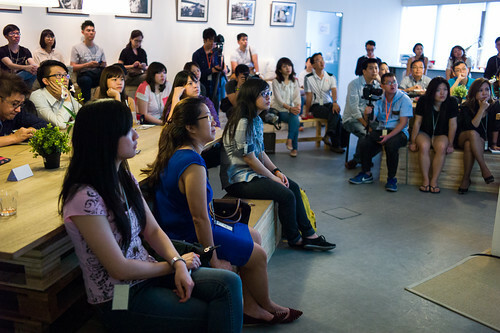 UCP forces participants to hone their networking skills, an invaluable asset in business. With a crowd of about 40 people (the fee for the session was only $50), these sessions were designed to be small in size to allow quality networking, and networking is one of the core objective of UCP – to bring together like minded individuals and entrepreneurs, place them in a hot pot frothing with ideas, overrun with creative juices, and stirring them to create opportunities for business and community change. One of the highlights of UCP is the speed networking session, not unlike speed dating, where participants will get a chance to talk to another person of their choice within a set time limit, and at a sound of the bell, make the swap for another participant. Name cards are exchanged, ideas and opportunities for cooperation were created during such sessions. 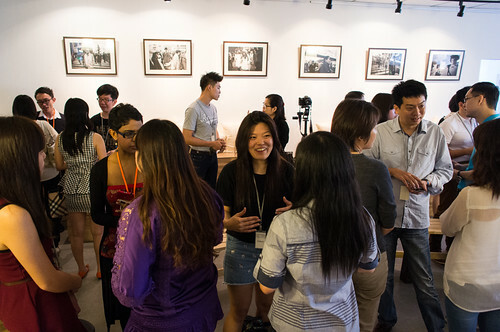 Networking sessions allow exchange of ideas and increase chances of finding collaboration opportunities. 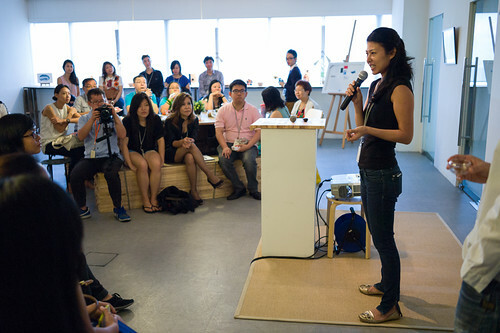 Alina of abundantearth.sg introducing herbal tea to the participants. As a bonus, Alina, clinical herbalist and founder of Abundantearth.sg brought along a selection of fine teas for everyone to try. Kevin Teo, founder of Macarons.sg also sponsored free macarons for everyone. 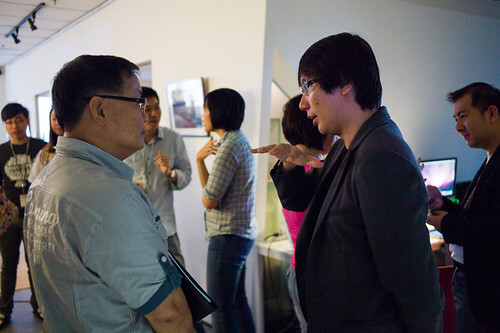 Kevin Teo of macarons.sg (right) chatting with a UCP participant about his business. 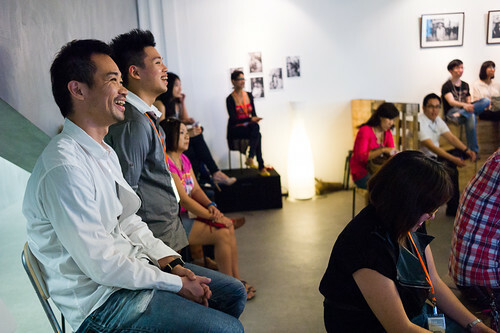 Kenny Low (extreme left) the brainchild of UCP enjoying himself at the talk sessions. UCP is the brainchild of Kenny Low, Schwab Foundation’s Social Entrepreneur of the year in 2007 and founder of City College, a school which has evolved from an institute with a social mission of helping the lost youths of Singapore who have dropped out of the mainstream education system to what it was today, a private school offering O level, English and diploma courses meeting the needs for alternative education pathways in Singapore. Kenny is also the founder of the highly successful O School, a dance school with a social entrepreneur twist, bringing kids off the streets and channeling their energy and creativity into dance, at the same time providing employment to my dancers and a platform for dancers to showcase their talent. Check here for more pictures from UCP and do like the UCP facebook page here for updates on the next UCP session in June, featuring 2 young entrepreneurs who started their business in their teens. I have learnt some valuable lessons from this session and it’s definitely worth the time!